Welcome to our Free Printable Dot to Dot worksheets up to 10. Here you will find a a selection of dot-to-dot worksheets suitable for kids of Kindergarten grade. These dot-to-dot sheets will help your child learn to count and recognize numbers to 10. 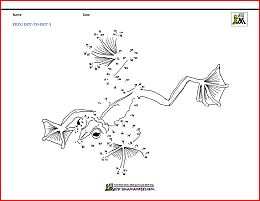 Here you will find a range of Dot-to-Dot 1-10 Worksheets. The following worksheets involve the important skills of counting and reading numbers. count up to 10 in order. We also have dot-to-dot coloring pages up to larger numbers. Use the link below to choose which page you need. Check out our themed dot to dot worksheets - each page has a different theme! These sheets will help your child learn to write and form the numbers from 1 to 20 correctly. There is also a counting challenge on each sheet which involve shading the correct number of objects.